I haven’t been doing the best job of keeping this ‘blog up to date. But, I was thinking, maybe I should start keeping track of some of the bike routes I’m doing here. Here’s a map I snagged from Gmaps Pedometer of a route I did last week. The traffic around Austin is kinda nasty so I try to find rides outside the city. This is just part of a route I did many years ago on an overnight ride to Salado from Austin. I drove up to Florence and parked in the ‘downtown’ area of Florence. That’s where I started the ride. There’s not much to Florence hence the quoting of ‘downtown’. There’s a handy little grocery store in the main part of the downtown area though (on main street) so a good place to start from. You can pick up water or other stuff there. It’s the kind of grocery store you really only find in really small towns like Florence. The route from Florence to Salado isn’t very heavily trafficked. Part of it (the part in Williamson county) has a shoulder. But that doesn’t last long. Most of the route is in Bell county and there is no shoulder. But there wasn’t much traffic. About 19 miles out you hit the I-35 frontage and from there can make your way over the overpass and into Salado. Salado‘s a cute little town and when the weather’s hot is a good place to pick up another bottle or two of water. The ride back to Florence seemed more up hill than I would have expected, but part of that was due to the fact that I had a 10-15mph headwind. At least that’s what it seemed like. 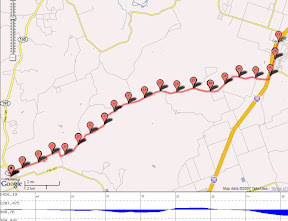 By the time you’ve gone over and back and meandered around Salado, you’ll have ridden 40 miles if you do this route. As a someone that used to live in Minnesota, I still marvel I can do this ride in February.